Tomato is vegetable or fruit which is very usefull for our health. Tomato contain so high of vitamin A. You know that vitamin A is very good for normal vision, the immune system, and also for reproduction. There are many of fruits and vegetables which contain of vitamin A, and one of them is tomato. This vegetable is easy to found in surrounding. You can find it at yard neighbor’s house or at the garden behind the house. Tomato is very easy to grow but give high benefit for human being. In this article, I want discuss about how to planting this vegetable in pots. Wow, it gonna interesting, let’s continue read below! 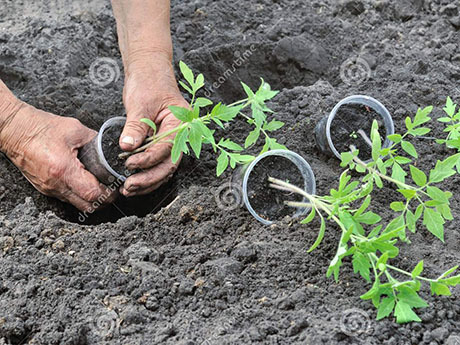 As well as tomato cultivation in the field, what is needed here is perseverance and a little knowledge of how to plant tomatoes, so that tomato seeds can grow well though only with pot as media growing. If you have a bit of land in the yard, then it can be very useful for growing tomatoes. 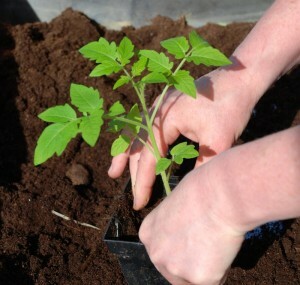 Especially if you can pick tomatoes in your own home yard, it can reduce the household budget. The main factor that determines whether a tomato plant can grow well is your own understanding. 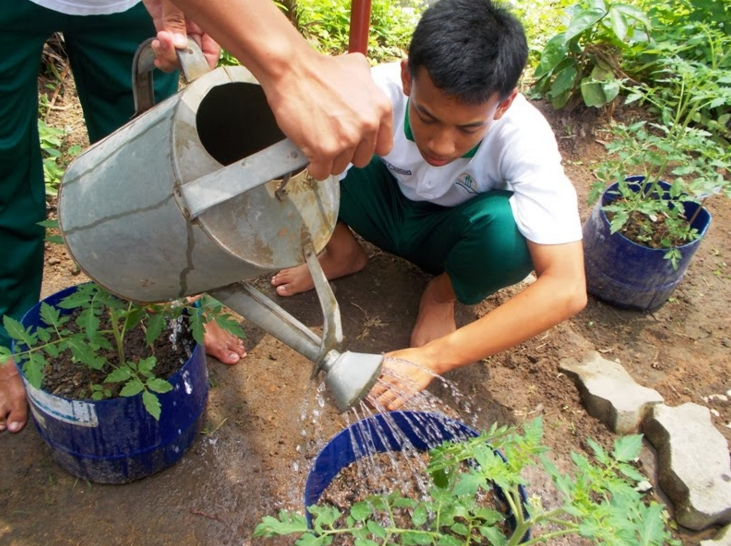 An understanding of how to plant and cultivate plants in pots. 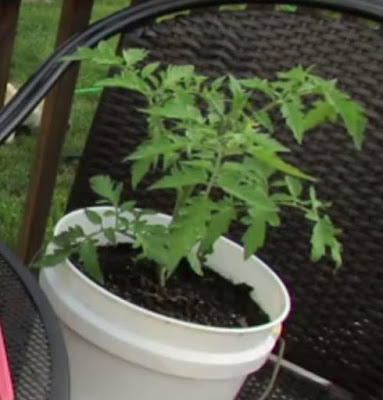 The following are the steps in growing a tomato plant in a pot. 1. Choose the Seeds of Tomatoes. The first important point is to choose tomato fruit seeds, so the results are good and abundant. Choose a tomato fruit that is not defective and contains no diseases and pests. Select perfectly mature tomatoes and thin skin. Has a larger size than the others. Have no defects or are affected by pests and diseases. Has a uniform seed density when cleaved. Tomato seeds look large and if soaked not floating. If you are still have trouble how to choose the best seeds, then you can ask the farmer or come to the seller of seeds. Tomato seeds obtained from farm seller will likely be better quality than if you choose your own seeds. 2. Sowing the Seeds of Tomatoes. Once the tomato seeds are obtained, the next thing to do is sowing the tomato seeds. Then soak the seeds of tomatoes into water which has been mixed with fungicide. The purpose of soaking the seeds of tomatoes into the liquid of fungicide is so that diseases and pests in the seeds will die and not interfere with growth of plant. After the seeds are immersed in the liquid, then put the seed into the seed media (planting medium). Seed media can be a mixture of soil and compost fertilizer with a ratio of 1: 1. Please make a hole in the medium of seed with a finger, then enter the seeds of tomatoes, then close the hole with the soil. Place the media of seed in the shade (enough with the sun in the morning). Next is a regular watering. By watering regularly at the morning and afternoon, the seeds of tomatoes usually have started to appear sprouts. When stepping on the age of 7 to 10 days from the time of planting. 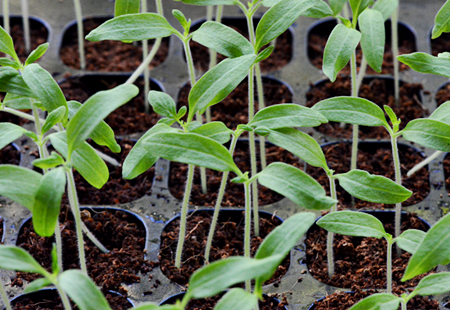 Let the tomato seeds which have begun to appear in the seedlings medium until little bit old, and ready to be moved into the pots at 15 to 20 days from the time of planting. 3. Selection of Pots as Planting Medium. Choose the type of pot can use materials derived from ceramics, cement, and clay. 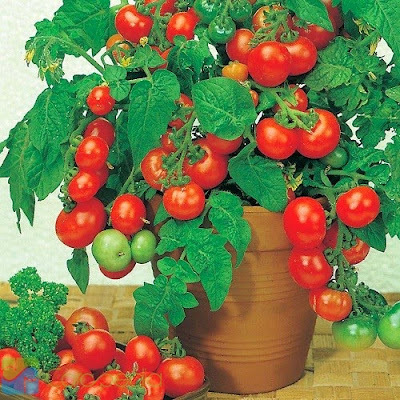 However, it should be noted that the good pots that can provide cavities for water access and also the air circulation required by the roots of tomato plants. Besides flower pots, we can also use used tins or medium sized polybags. Planting medium, used is a mixture of soil, sand and compost fertilizer with a ratio of 1: 1: 1. Also do not forget to make a hole the bottom of the pot so the water from the watering does not affect the roots of plants which can make roots rot. 4. Move the Seeds of Tomatoes from Seedland into the Pots. After the seeds are 20 days from the time of planting, the next step is to move the tomato seed into the pots. When moving tomato plants, we should be careful to move it, so that tomato plants are not damaged. Remove the polybag slowly, then plant the seed into the pots along with the soil which is still attached to the roots of the plant. 5. Maintenance of Tomato Plants in Pots. After removing the 20-day-old tomato plant into pots, place the pot in the yard of the house in the early morning sun, but still get a bit of shade when the day comes. Keep doing regular watering every morning and afternoon so the plants get enough water supply. Do not forget to plug the bamboo around the plant so that the tomato rod can propagate in the bamboo. Giving compost fertilizer every 2 months can also increase the level of fertility of your plants. If the tomatoes are around 60 or 90 days since start growing, the tomato plants can be harvested according to our needs.